Coming from the gentleman and scholar who brought us The Alchemist, more to-the-point words could not be spoken about what some might consider an ambiguous skill set or topic at best. 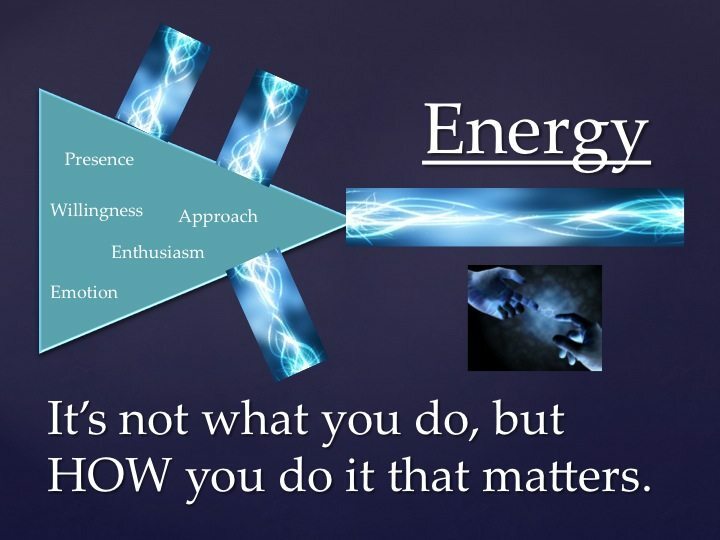 The simple truth is that our energy, the HOW we do what we do, matters more than anything. I drove to the airport to drop family off at 5 am this morning. I then spent four hours on phone calls, answering emails, and working on a variety of projects. By 11:30 am, I’d had a very full day. But things were just getting started. In front of me sat 23 college students, most in the throes of senior-idus or spring fever, eager to pass the next two hours of class as quickly as possible. I had a choice to make: I could let my own fatigue show, and probably cause the session to really drag on, or I could take a deep breath and put every ounce of my being into teaching the topics at hand through a variety of activities, including my favorite sport of all times: crazy ball (watch for a post this summer about the importance of this game). Sure, there were moments of tedium during my mini-lecture. And there wasn’t a standing ovation at 1:30 for my performance either. But I promised these students that I would make this leadership course one of the best classes they take in college. So I gave the class period, as I try to every class period, my enthusiastic, positive all. How are you doing what you’re doing? Are you spreading vibrant energy? This doesn’t mean toe-touches and cheer-leading for everyone. Yet it does mean passion, excitement, love, and optimism.